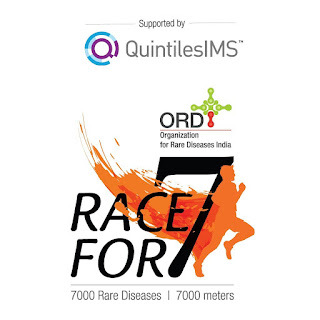 Bengaluru, February 16, 2017: The Organization for Rare Diseases India (ORDI), a non-profit organization committed to addressing the challenges of the rare disease community in the country, today announced the 2017 Race for 7. Launched in 2016, Race for 7 is a 7000 meter run/walk to raise awareness for the 7000 documented rare diseases and the intent is to target 7000 participants, each to represent one of the seven thousand rare diseases. The event will be held on February 26, 2017, to commemorate Rare Disease Day which falls at the end of the month. The biggest challenge rare disease patients face is diagnosis, treatment and access to affordable care. It takes on an average seven years for a rare disease to be diagnosed. “Eighty percent of rare diseases are genetic in origin while the rest is the result of infections (bacterial or viral), allergies and environmental causes. Fifty percent of patients are children who rarely make it past their fifth birthday due to their illness and resultant complications” said Dr Meenakshi Bhat, Consultant in Clinical Genetics, Centre for Human Genetics. The theme for this year’s Rare Disease Day is Research with the slogan With Research Possibilities are Endless to highlight the importance of research into rare diseases. “The lack of available treatments leave rare disease patients and their families searching for new options and new hope. More research in rare diseases will help speed treatments to market and transform the lives of patients and their families,” said Dr Anita Patwari, Medical Director, QuintilesIMS, sponsors of Race for 7. QuintilesIMS has provided clinical services for more than 245 rare disease studies in 96 countries since 2011. Race for 7 will be flagged off at 7.00 am on Sunday, February 26th at St Joseph’s Indian High School. Participating in the event will be the public of Bangalore as well as patients from across the State. Come show you Care for Rare.